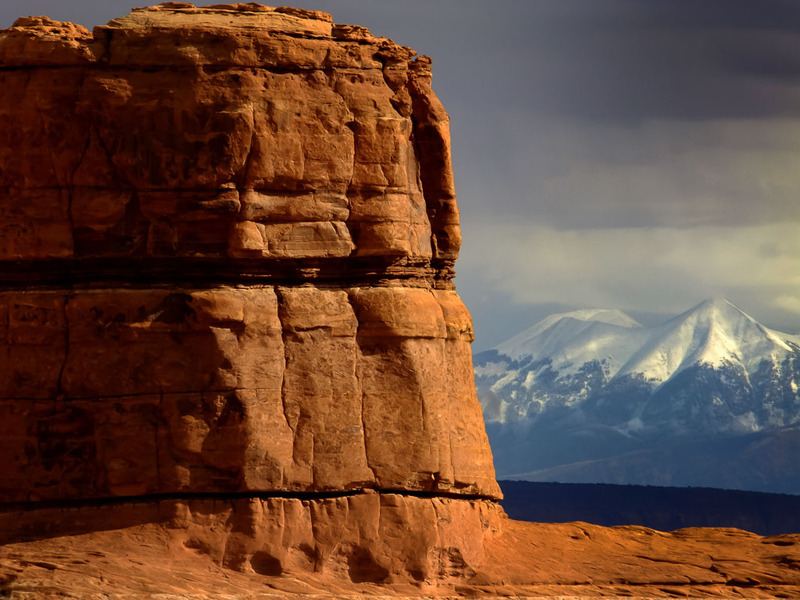 Sandstone formations stand in the foreground with the La Sal mountains in the background. 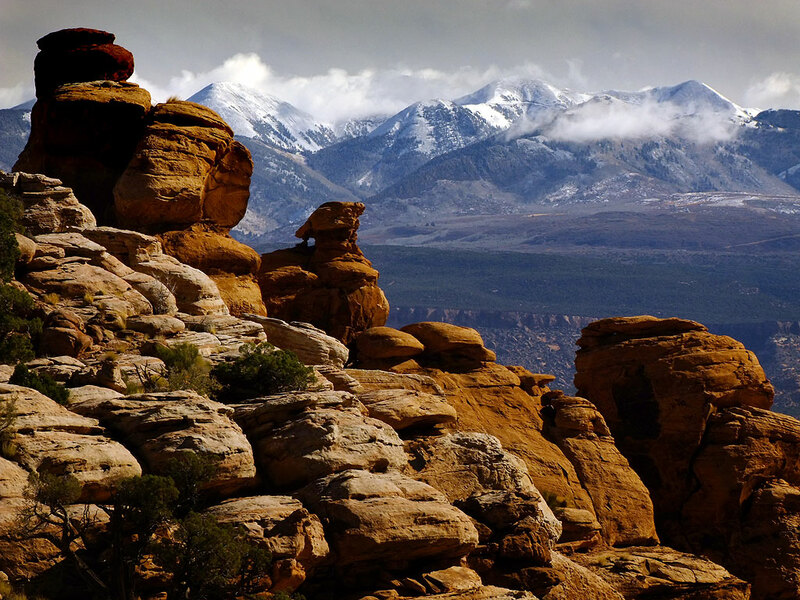 The La Sals are a signature formation in for the Moab, Utah, area. The second Abby got in the car in Farmington for our drive to Moab, Utah, I asked her to smile for me. My wife Abby and I find that this drive, which we have made many times both alone and together, is never boring. Among other things, it represents the path to adventure. 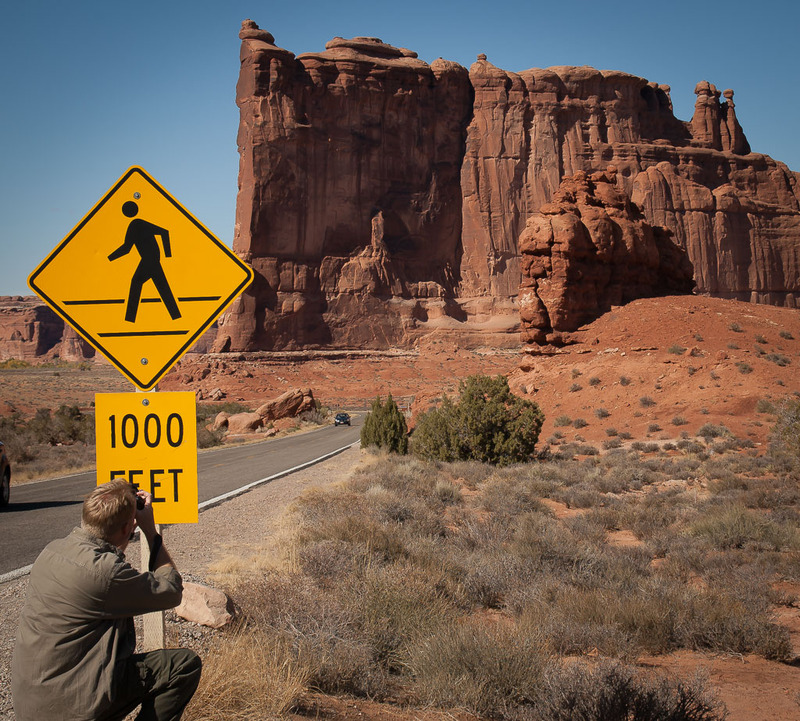 The road itself is mostly interstate highway, one of the most traveled of all the routes connecting the wild west with the rest of America, Interstate 40. 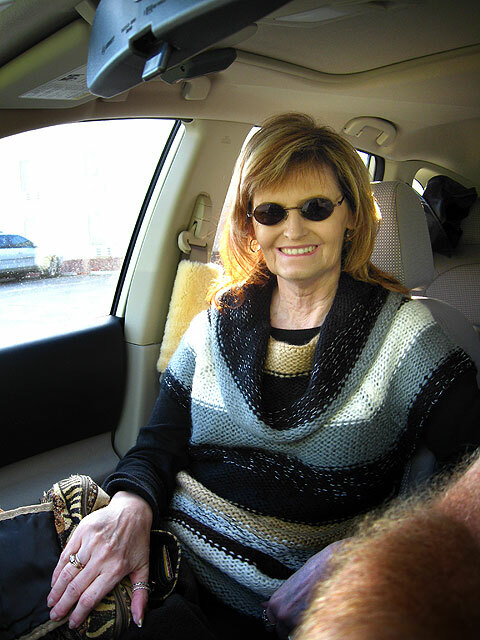 Over the years, we have learned the route well, including most of its photo opportunities: the red quonset hut, the leaning water tower, the giant cross, Cuervo, the “plague town,” Tucumcari Mountain, and on and on. By the time we arrived in Farmington, after some 14 hours on the road, sleep came easy. 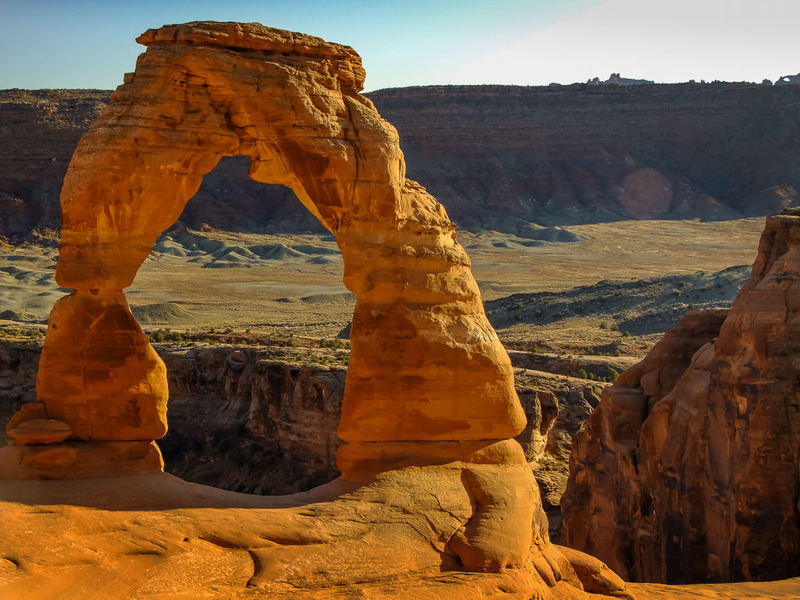 Though Delicate Arch in Arches National Park is among the most-photographed natural icons in the world, it still seems worth photographing. Abby and I have a small special claim to it, since we got married there in 2004. 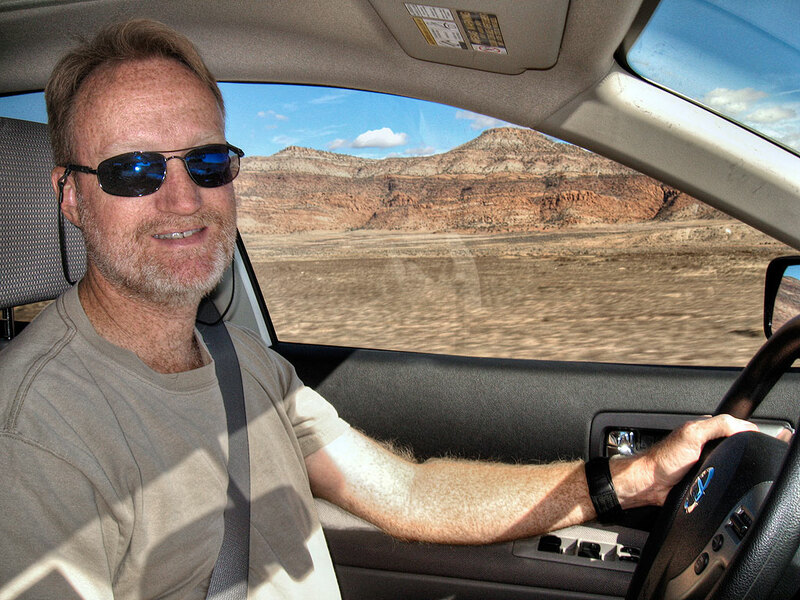 Abby made this image of me driving our route to Moab, Utah. There are several routes into southeastern Utah, and on this occasion, we decidedto let the GPS suggest our route. It took us through Four Corners, then up the Aneth highway, which is a neat little piece of scenery, then to Blanding, where we always stop at their clean, interesting visitor’s center. We usually buy maps there, and sometimes they have gift bags for us. 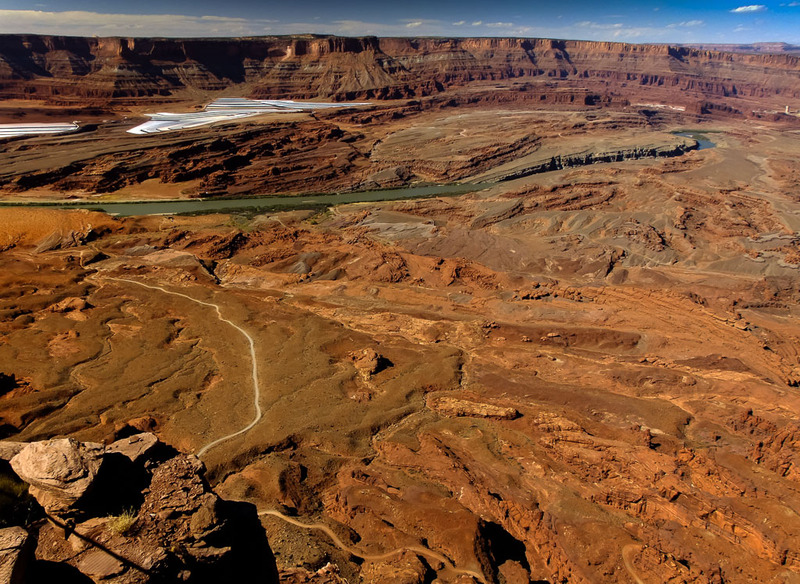 This wide view from the Anticline Overlook shows the amazing stratigraphy of southern Utah. Near the top left of the frame, you can see the potash mines. This image by Abby shot from the Anticline Overlook shows the view down Kane Creek to the southeast. By midday we were at Hatch Point, which we like because it sports excellent overlooks, and we can hike a little with the Chihuahuas, Max and Sierra. 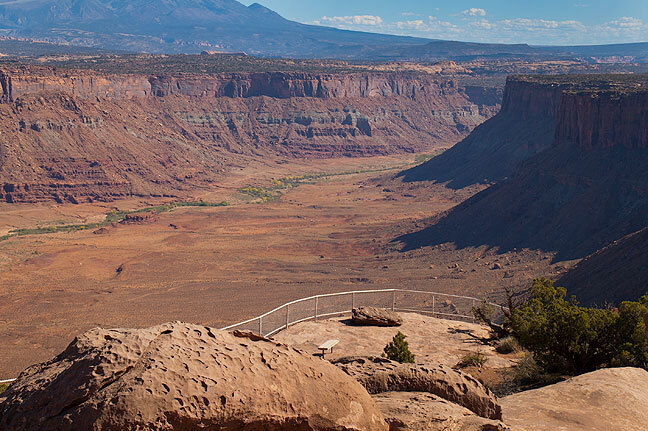 Crews were working on the unpaved portion of the road, and had taken down the sign to the Canyonlands Overlook, which we took anyway, only to find that it had washed out. We continued on to the Anticline Overlook, where we hiked around the short trail with the dogs. 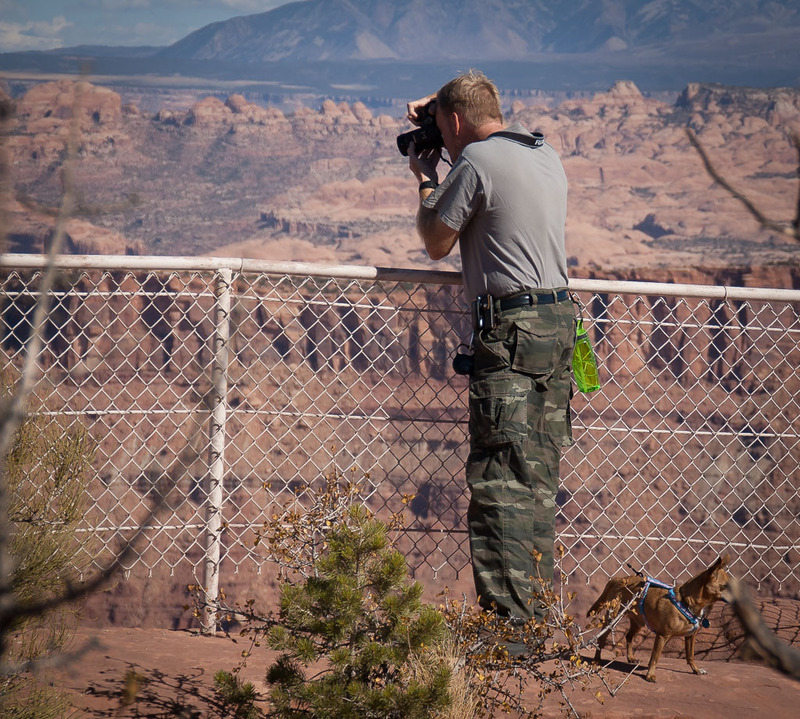 The author photographs the Anticline Overlook on Hatch Point, Utah, with Max the Chihuahua tethered to his belt. Abby poses at the Anitcline Overlook, Hatch Point, Utah. This view looks up Kane Creek and shows the famous Hurrah Pass Road. This view looks from the Anticline Overlook southeast down Kane Creek Canyon. 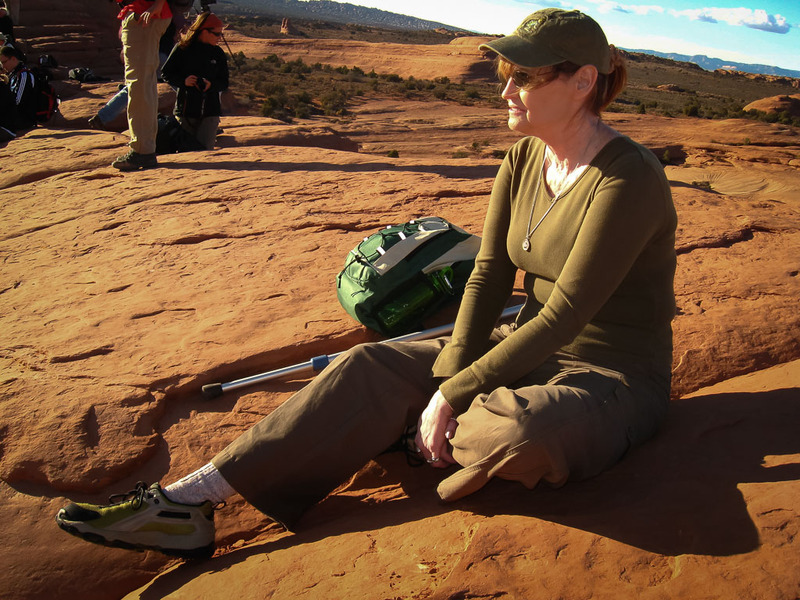 By late afternoon, we were in Moab, and settled in to our motel for the night. 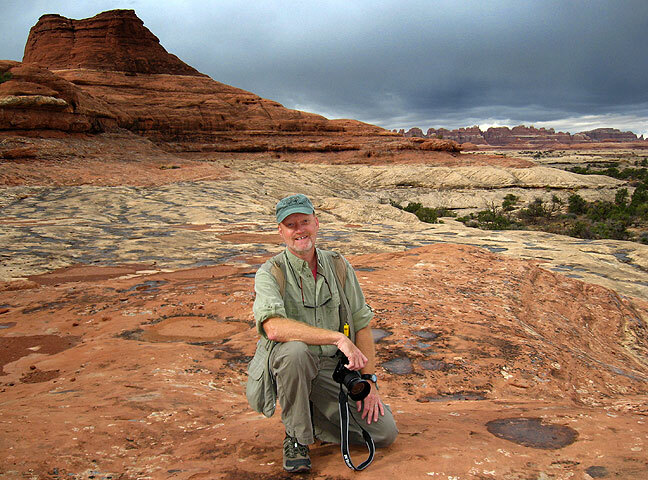 Despite rain and even a bit of hail, I had a good time hiking at the Needles District at Canyonlands National Park. With rain in the forecast, I got a before-daybreak start. 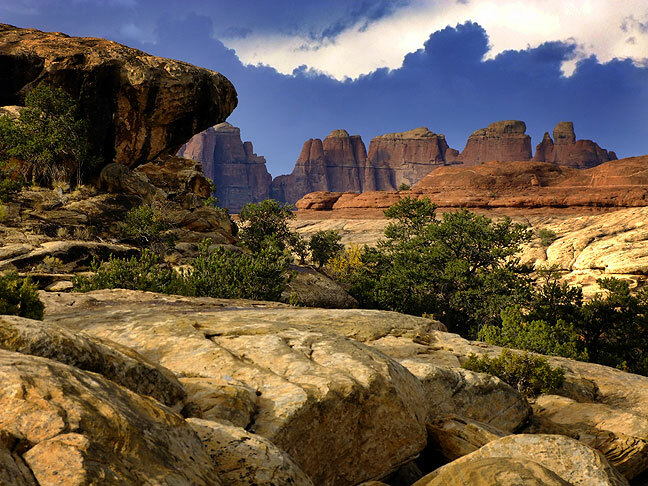 I drove south to the Needles District at Canyonlands, where I thought I could hike from the Elephant Hill access road to Chesler Park, then turn north and make the Devil’s Kitchen/Devil’s Pocket loop. It is the only trail in the Chesler Park area that can be day-hiked that I haven’t seen. The weather looked foreboding, so instead I struck out south from the Squaw Flat campground, to the bench at Wooden Shoe Butte. I felt that I could see some of the heart of The Needles, do a little exploring, and still be close enough to the trail head that if rain came and stayed, I wouldn’t be out in it for too long. 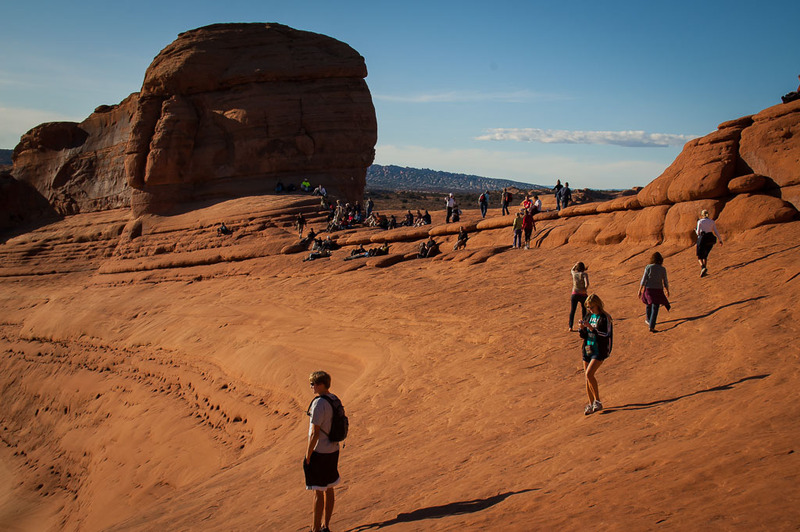 Once I got to the butte, I broke from the trail and explored to the west though an exceptionally beautiful section of slickrock benches and buttes. I could see dark clouds to the west and hear thunder, so I navigated back to the trail and headed back to the trail head. About a mile from cover, rain, with embedded hail, started, but was tolerable, and didn’t last long. It ended up being an easy hike. 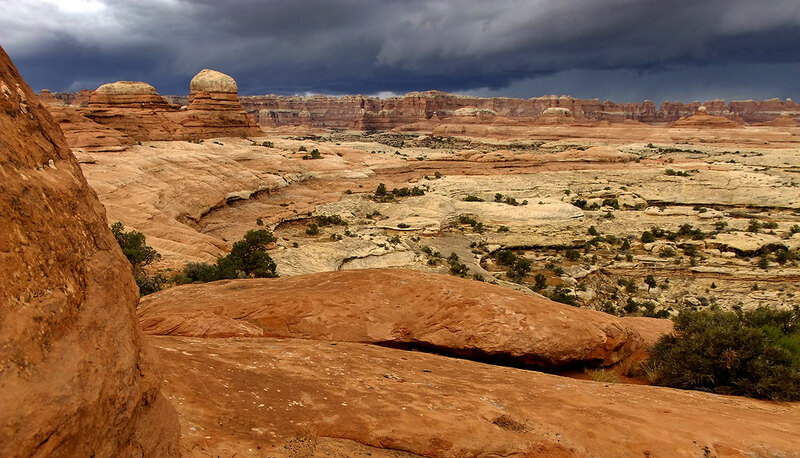 A beautiful and foreboding thunderstorm descends on The Needles at Canyonlands. 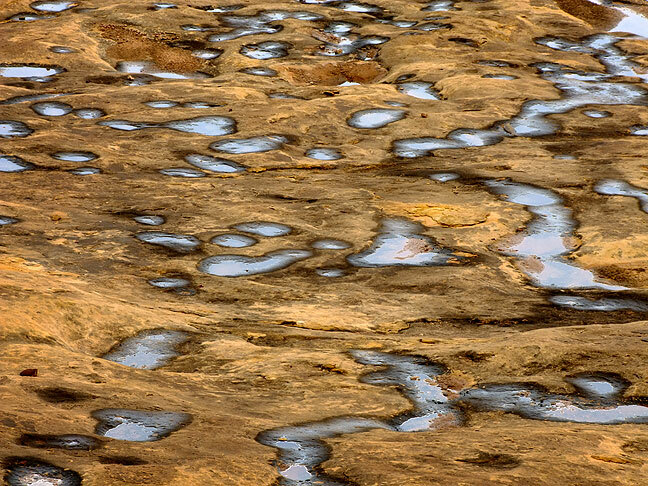 Potholes full of rainwater stretch across slickrock at Canyonlands; some creatures complete their entire life cycles in these puddles, in the time it takes for them to dry up. Your host poses on a slickrock bench as storm clouds approach at Canyonlands. This view east toward Wooden Shoe Butte with Sixshooter Peak in the distance. This is a rather striking view of thunderstorm clouds on the western horizon from the heart of the Needles district, Canyonlands. As I drove out on the main road, the rain began to pour, and at one point lightning struck about 300 yards from the car. A little farther down the road, I stopped several times to attempt to photograph the amazing cottonwoods along Indian Creek. 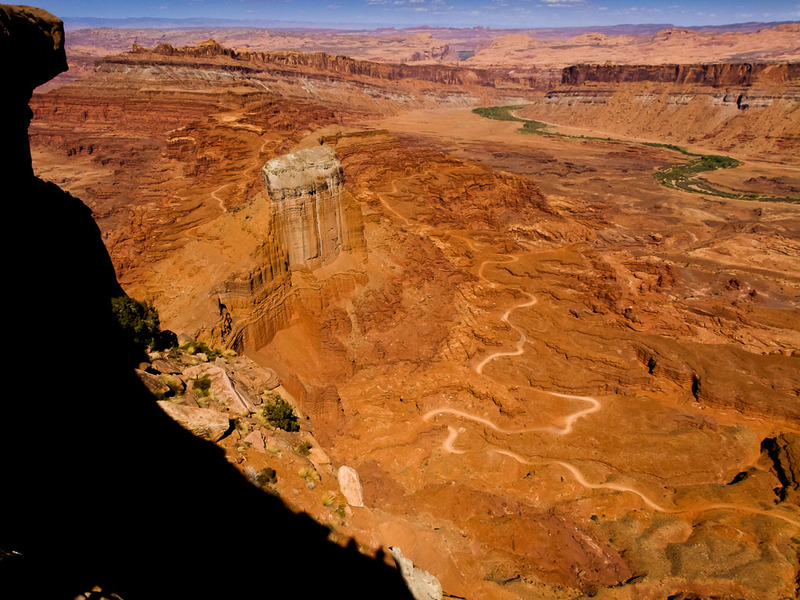 The formations of Canyonlands are set against the La Sal Mountains. 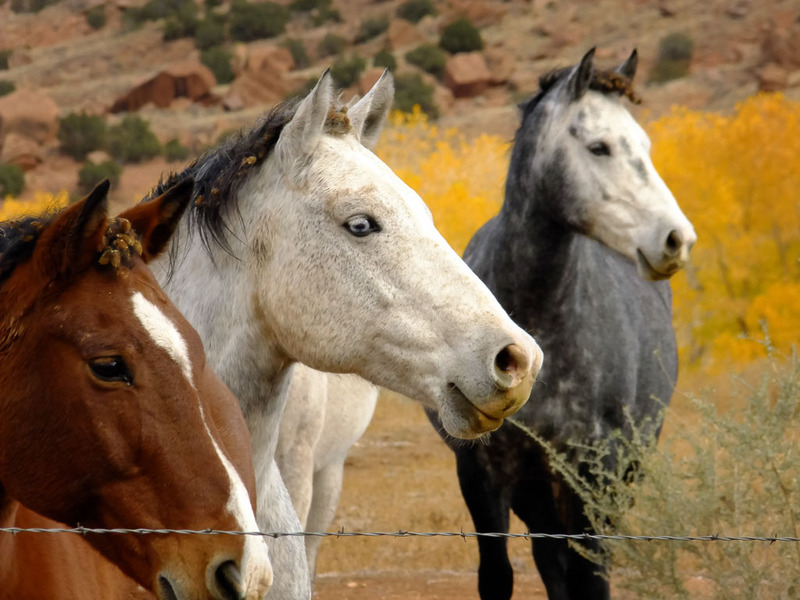 I came across these horses at Indian Creek on my way out of Canyonlands. They seemed healthy aside from their manes being choked with cockleburs. 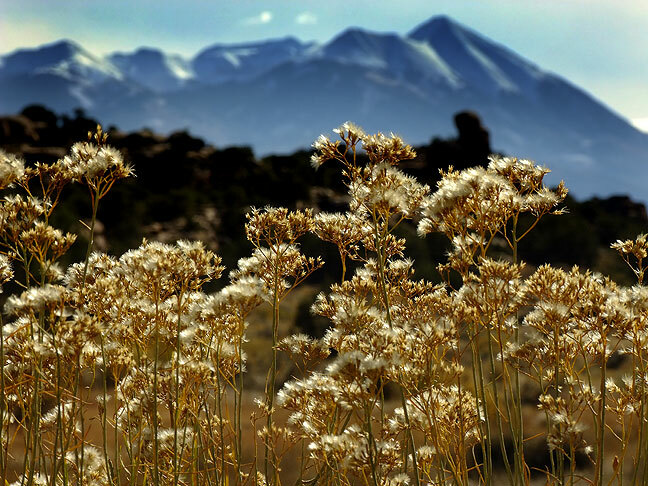 Desert vegetation with La Sal Mountains in the distance; the plant life tried to take advantage of recent autumn rains with one last growth period before winter. Abby felt like sleeping in with the dogs in the morning, so I headed a few miles south of Moab to a trail I had seen on the map for years, but never tried, the Hidden Valley trail. Almost immediately from the trail head, short, rocky switchbacks lead up the 680 feet that from the Spanish Valley appears to be a wall of rocks. Near the top is an inlet that opens into a wide, flat valley. 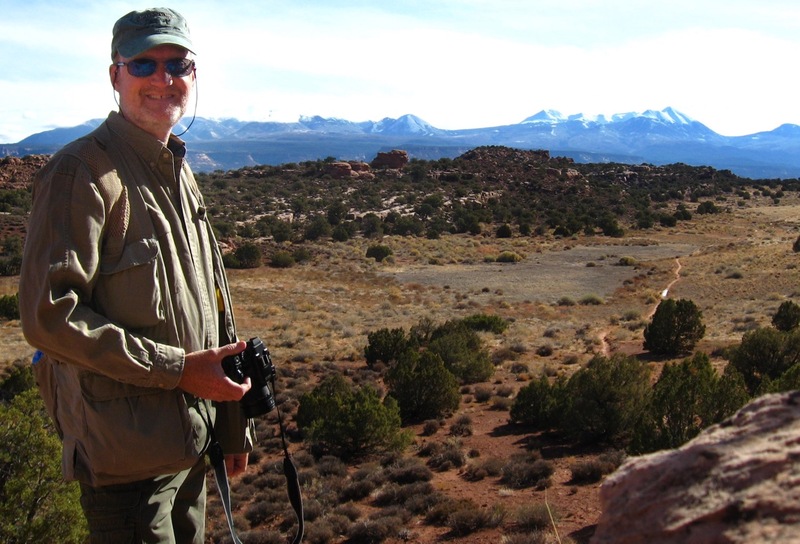 The trail follows it another two miles northwest in the Behind the Rocks Wilderness Area to Petro Pass, where it joins the Moab Rim Jeep trail. I was fortunate to have a chilly breeze and clear, blue skies. I turned around at the pass and headed home. The initial slope leading up to Hidden Valley via switchbacks. Near the top of the switchbacks, the trail opens up into the valley. 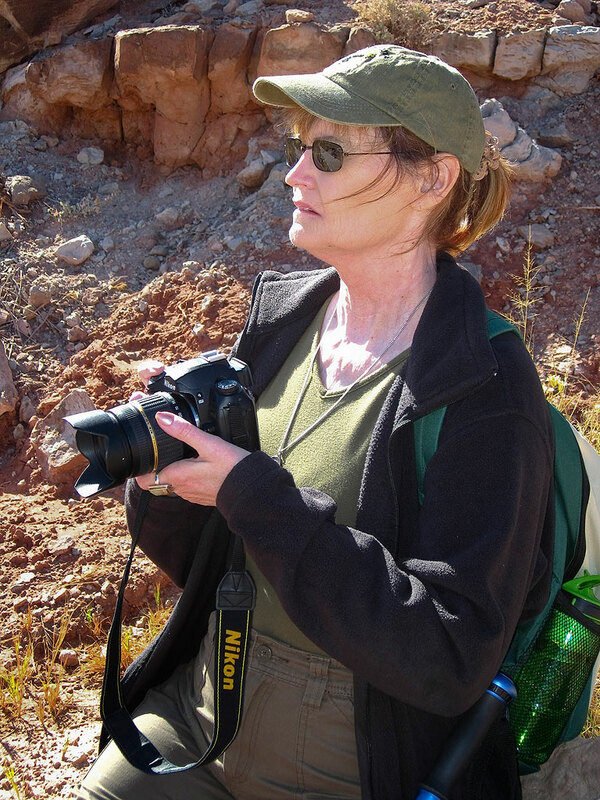 The author poses for a photo at the top of the Hidden Valley trail. Tree silhouette looking east toward the La Sal Mountains. 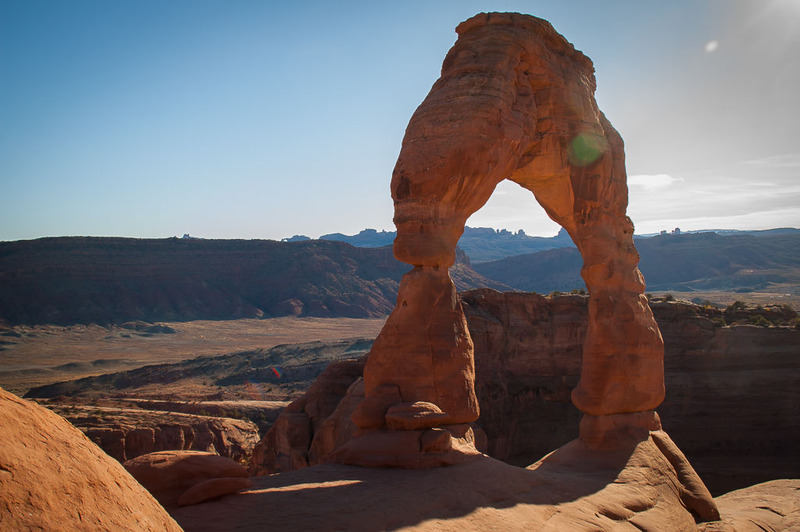 By late morning, Abby was up and feeling like a hike, and when we are in Moab, we like to hike to Delicate Arch in Arches National Park, where we got married in 2004. 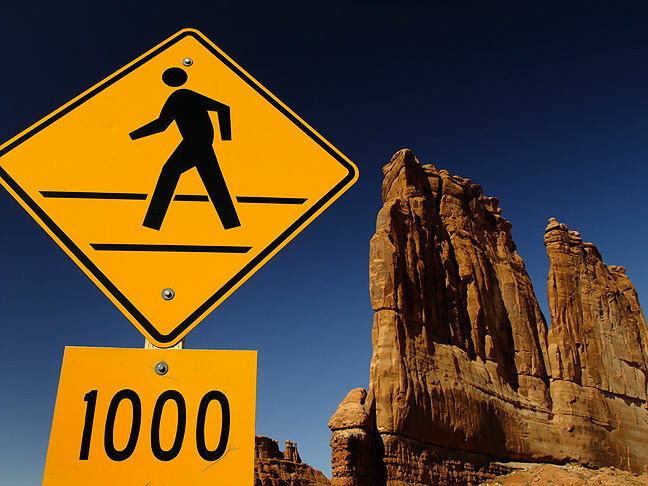 A traffic sign and Courthouse Towers are set against a perfect blue sky at Arches National Park. Abby made this image of me making the previous image. We left the dogs in the room (since they are not allowed on National Parks trails), and made the hike. It was breezy and cool, the sky was a perfect pearl blue like the day we got married, and it was simply great to have Abby with me on “our” trail. Her knees were bothering her, so we took it slow, but that didn’t matter. 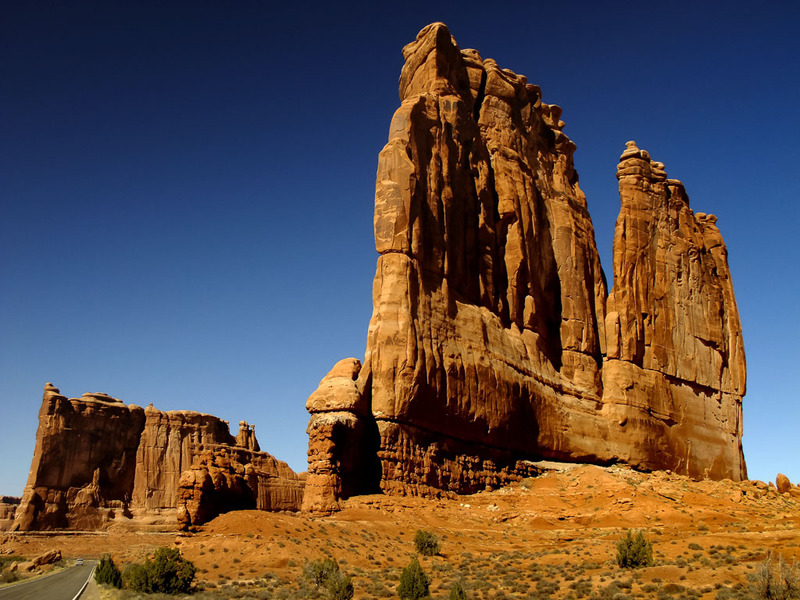 The Courthouse Towers stand tall on the main road at Arches National Park. Looking in the opposite direction from the Courthouse Towers are the petrified dunes. Abby made this photo. Abby pauses to make a photo at the top of “The Dome,” a long expanse of steepish slickrock in the middle section of the Delicate Arch trail. 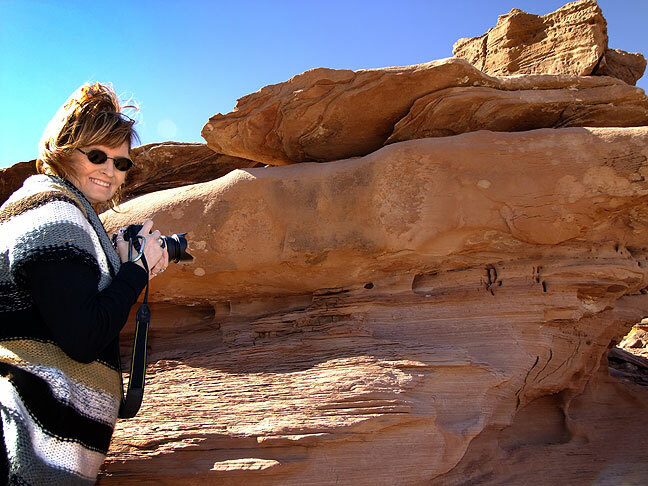 Abby makes pictures on the trail to Delicate Arch. At Delicate Arch I observed something new: no one was posing under the arch. In the past, particularly in the evening, the “photographers” and the “tourists” can get into arguments about who has the right to do what there. The photographers think they are making some important images (and of course think that they themselves are important), while the tourists just want to have fun. This time, however, was oddly different. There were more photographers than I have ever seen at the arch (in six visits), and most of them had tripods. Most of the cameras were very expensive digital Nikons and Canons. All but a few had set up on the approach to the arch, the ridge to the north one encounters as you first see the arch. 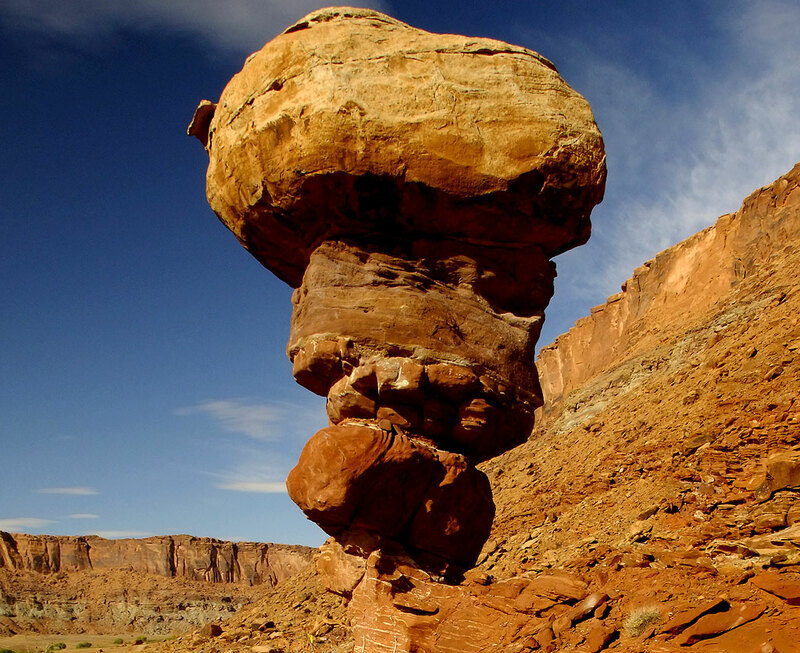 Oddly, this spot yields the most predictable image, almost a “mug shot” of this Entrada sandstone miracle. I have this shot; I make it every time I visit, since it’s so easy. But all these people were all making this same photo. Odd. Photographers of all stripes line up to make pictures of Delicate Arch. Abby soaks up the sun at Delicate Arch. In the midst of all this, Abby and I relaxed and enjoyed the afternoon. We didn’t come to make amazing photos. We came to celebrate five years of happy marriage after our wedding at this amazing place. Abby smiles in the warm autumn sunshine at Delicate Arch in Arches National Park. Near the top of the trail to the Arch, Abby and I saw this tree, half in a splash of brilliant October sunshine and half in deep shadow, and we both stopped to photograph it. I know I photograph Delicate Arch often, and always post it. But cut me some slack; I DID get married there. This view looks through the opening of Delicate Arch to the Windows section of Arches National Park. It’s hard not to photograph Delicate Arch, even though thousands of photos are made there every day. It’s even harder to resist the urge when you have special claim to it, which we do since we got married there. 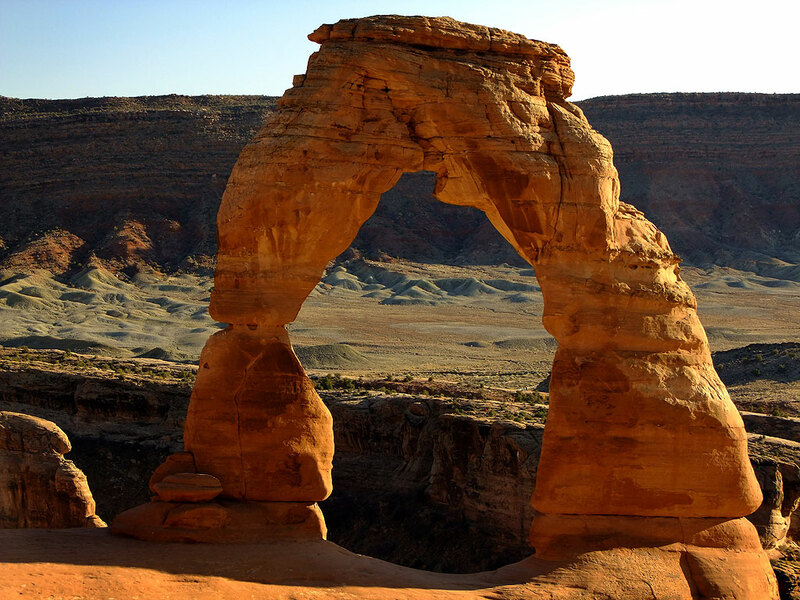 This is one of Abby’s images of Delicate Arch. Abby takes in the view on a perfect afternoon at Delicate Arch, five years after she and I got married there. About halfway up the trail on an expanse of slickrock we call “The Dome,” hikers can see the roads leading to the trail head. 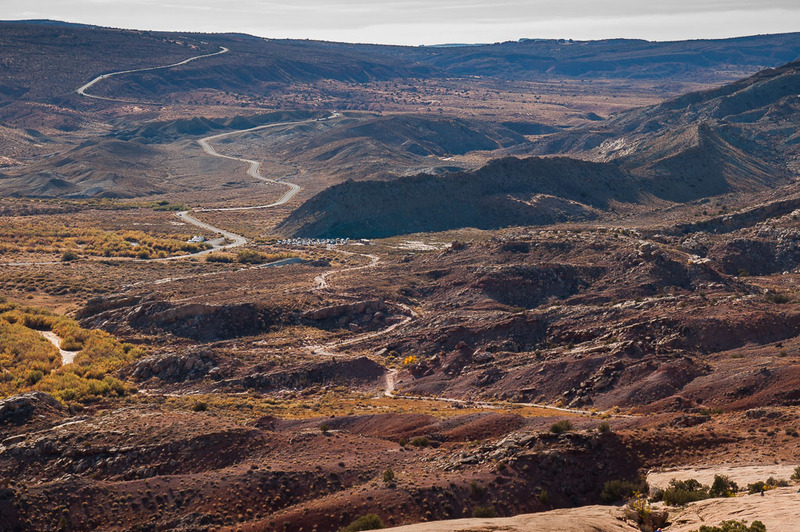 Near the top of the Delicate Arch trail, Abby made this striking image of the trail and park road beyond, looking west. 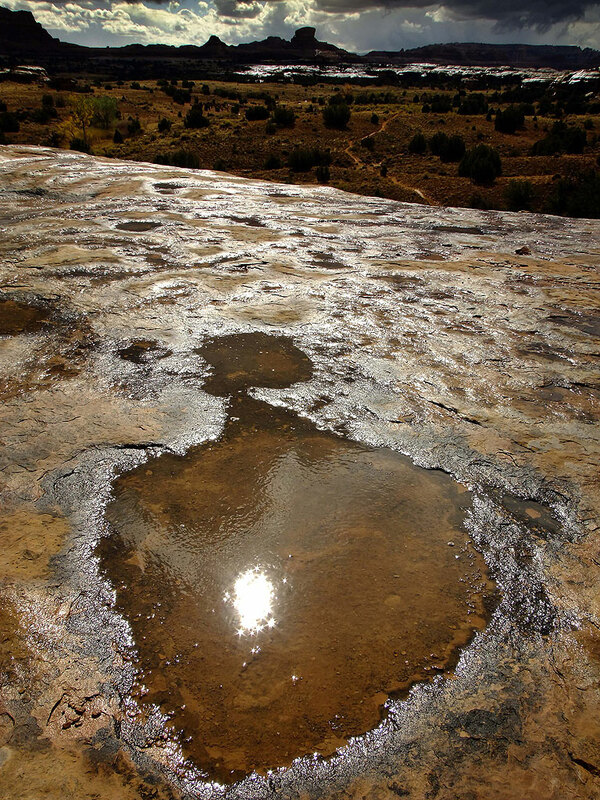 Potholes along the trail had more water in them than we had ever seen. 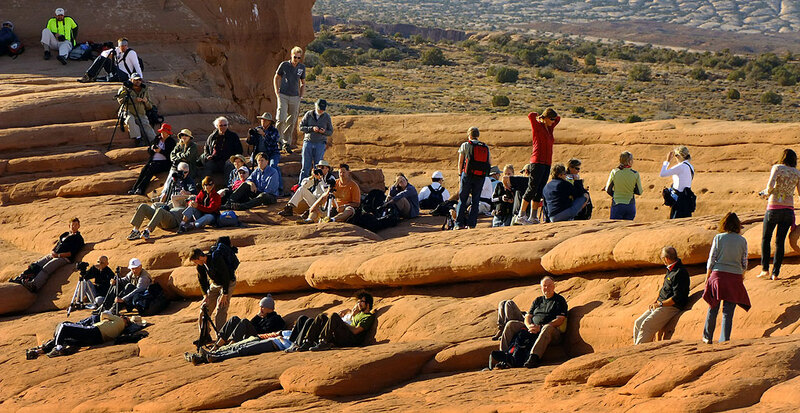 Abby photographed some of the visitors gathered at Delicate Arch. It was a beautiful day, so the crowds were no surprise. Sandstone pinnacle in warm, late-afternoon sun. Tree branches and sandstone cliff in maturing light. Tree with a splash of late-afternoon sunlight on it. This two-panel panograph of the Arch shows the “bowl” below it, the mesa across the canyon to the south, and in the distance, the park roads that lead to the trail head. A nice German couple asked if we would take a picture of them with their camera, and they did the same for us. The hike down was fun, too, and we both were tremendously happy to be there together. Abby and I pose in the spot where our marriage began, Delicate Arch in Arches National Park. 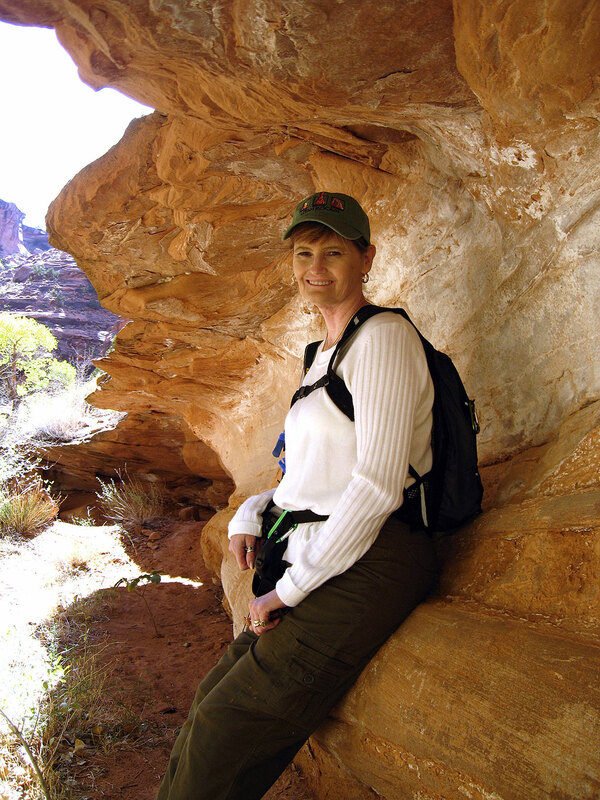 Abby smiles from a shady spot in Hunter Canyon. For our last day in Moab, we wanted to explore a few spots that we’d never seen, and where we could take the dogs. 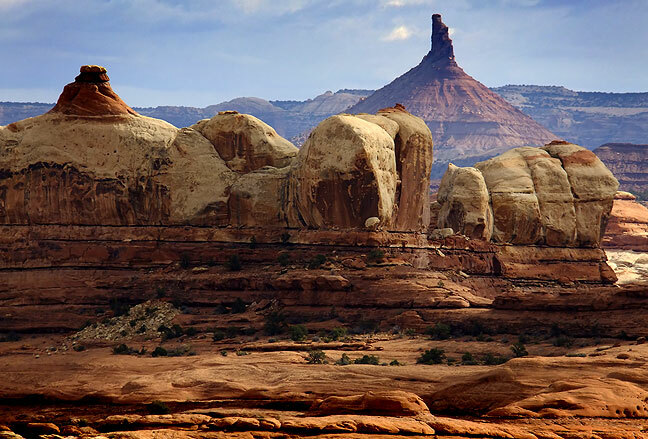 Our first venue was the legendary Sand Flats Recreation Area, a world-renowned Jeep and mountain bike paradise just east of Moab on the Porcupine Ridge. We drove around and saw dozens of tricked-out Jeeps, some dirt bikes, some ATVs (in southeastern Utah they are abbreviated OHVs), and of course lots of mountain bikes. We hiked for a mile or so down a Jeep road, letting the dogs play and taking a few pictures. We were passed by several dirt bikes, and a couple who had two West Highland Terriers. 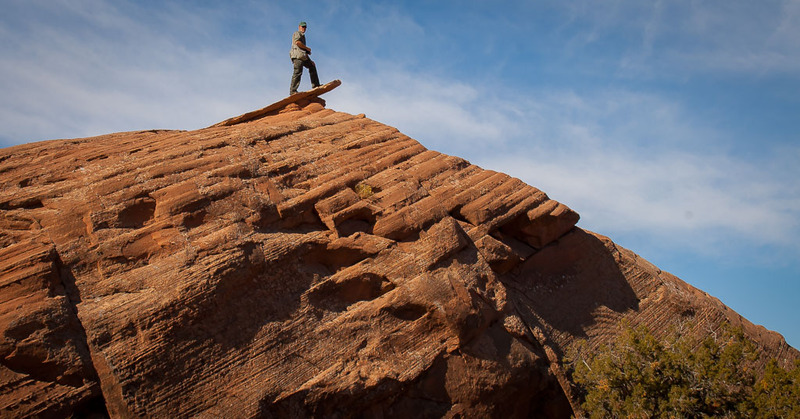 Your host poses on a formation called “The Diving Board” at Sand Flats Recreation Area east of Moab, Utah. 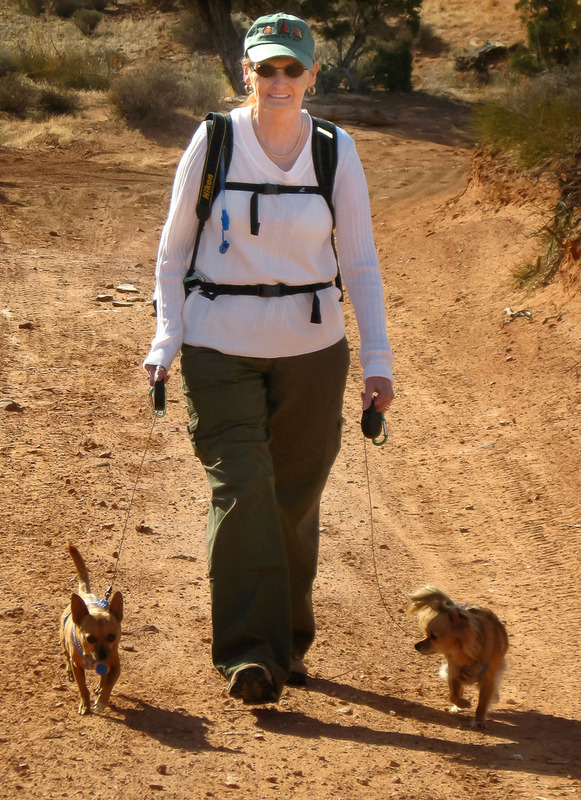 Abby and our dogs stroll around Sand Flats. Later in the morning, we drove to Hunter Canyon, a deep and impressive formation in the midst of dozens of towering sandstone canyons. With the dogs in tow, Abby and I hiked some of the way down the canyon, far enough to see and photograph Hunter Arch. This surprisingly lush Hunter Canyon is one of the side canyons along the winding Kane Creek Road southwest of Moab. The drive itself is spectacular, and this hike is a pleasant couple of miles in the midst of towering sandstone cliffs. Three and cliffs, Hunter Canyon. Autumn sunshine and Hunter Arch, Hunter Canyon. Abby and Sierra at an eroded sandstone boulder, Hunter Canyon. Finally, we drove the Kane Creek road to the intersection with the Chicken Corners road, and photographed an odd formation called the “Devil’s Golf Ball.” It was also neat to see the Anticline Overlook from the spot it over looks. Max the Chihuahua checks out the Kane Creek Road southwest of Moab, Utah. 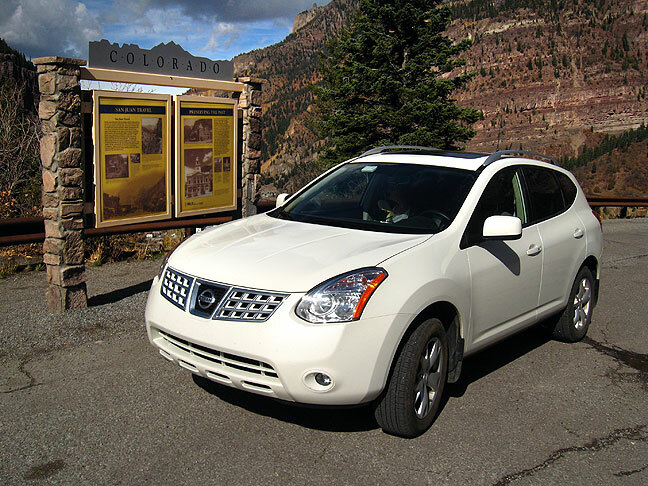 Our Nissan Rogue stands parked at the Ouray, Colorado overlook. Abby and I decided to take a longer route home than usual, since we had the whole weekend for travel. 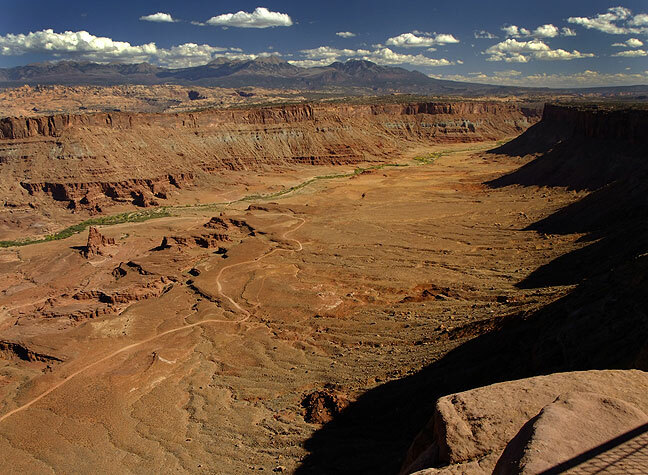 From Moab, we turned immediately east at La Sal Junction, crossing into Colorado near the Paradox Valley. 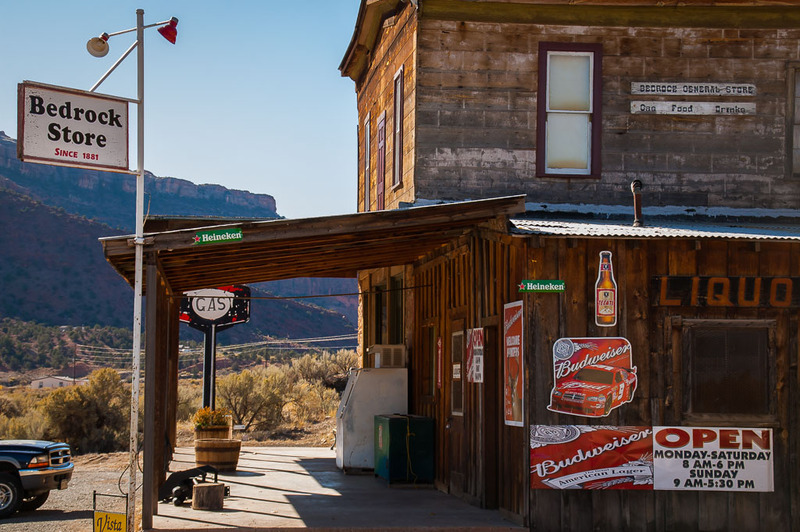 We stopped at a charming general store in Bedrock, Colorado, then made our way through the Dallas Divide, Ouray, Red Mountain Pass, Silverton, and Durango before joining our more familiar route south into New Mexico. 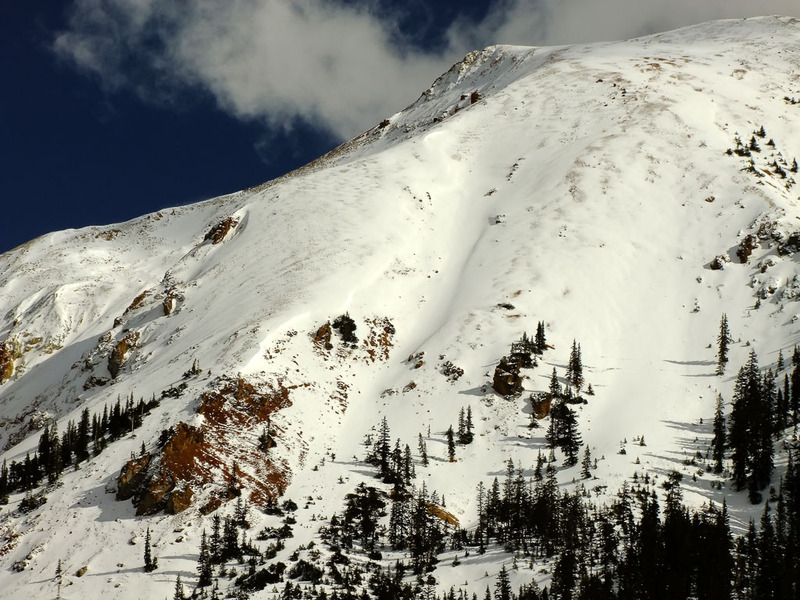 The mountain scenery and high country snows were inspirational. 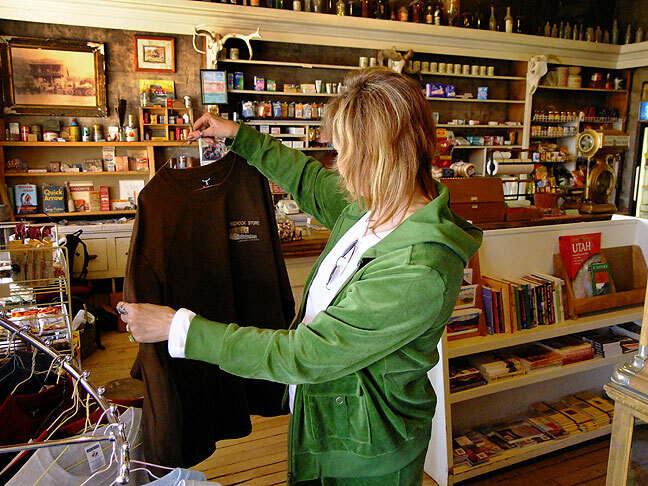 Abby shops at the rustic Bedrock, Colorado general store. 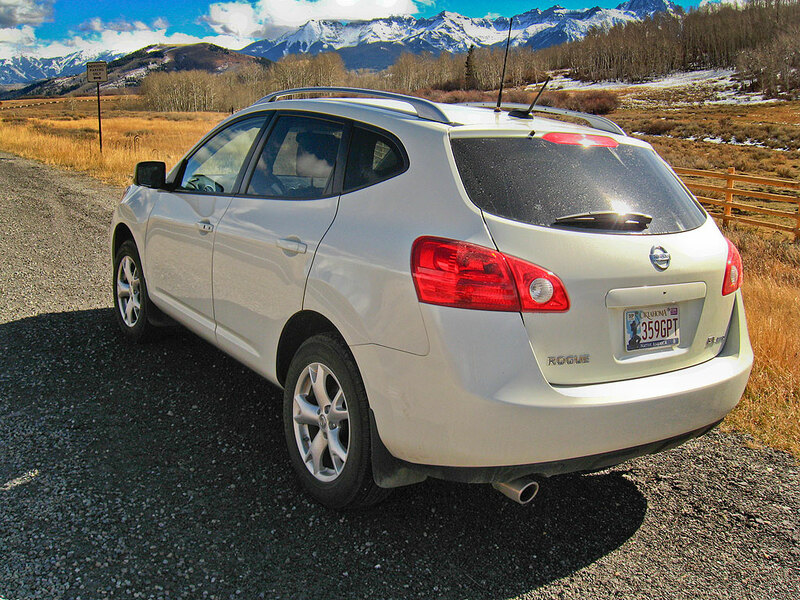 This trip was our first in our new Nissan Rogue, and Abby and I were both very pleased with its qualities. It got excellent fuel mileage, had plenty of space for us, our stuff, and our dogs, and was comfortable over the many hours on the road. There were several occasions when the all-wheel drive was a factor, and several more where its excellent ground clearance took it places my Grand Am could never have gone. Our dogs travel well and are little trouble. They seem to enjoy being with us no matter what, and take in the trail like they were born to do it. Abby and I had an excellent fifth anniversary vacation. Abby made this definitive photo of the Bedrock, Colorado General Store on our drive east. The Bedrock store was just across the Utah border, along a route in the direction of home that we had never taken before. 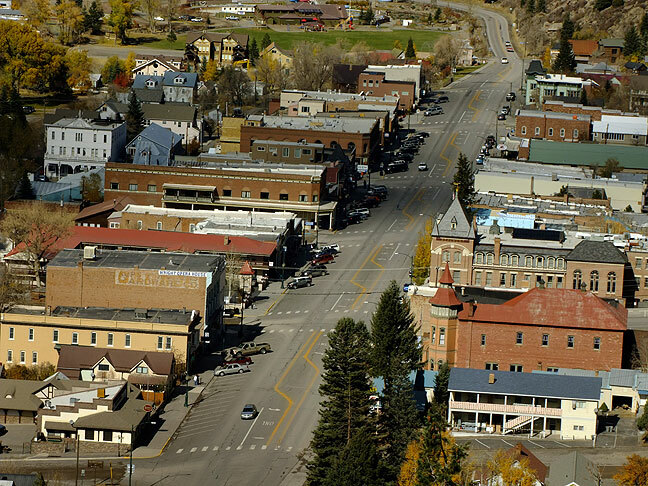 The next town on this route home was Ridgeway, Colorado. Looking down the main highway in Ridgeway, the first peaks of the spectacular San Juan Mountains appear in the distance. A view of one of the “14ers” of the San Juan Mountains along the famous “Million Dollar Highway” between Ouray and Silverton, Colorado. 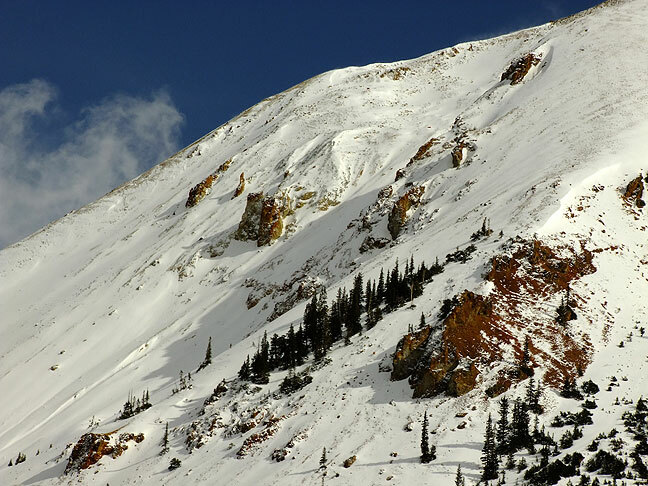 Snow clings to the steep slope of a 14er in the San Juan Mountains of Colorado along the “Million Dollar Highway” between Ouray and Silverton, Colorado. 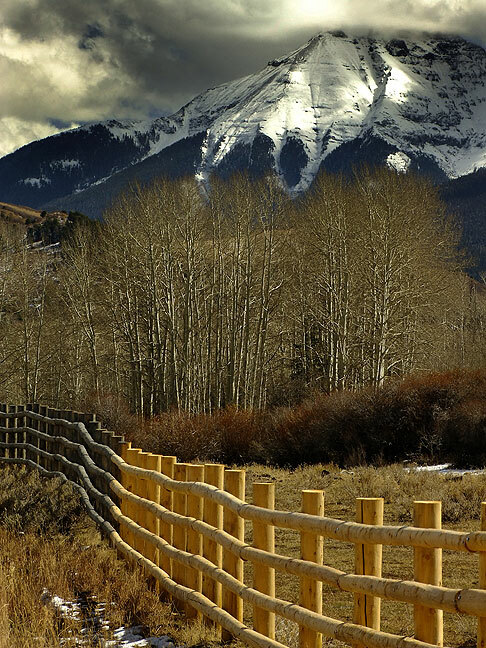 The snow-capped San Juan Mountains are beautiful and serene. 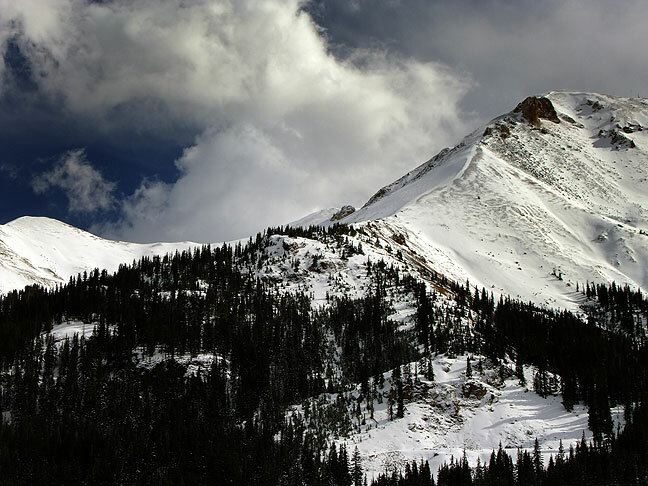 The Dallas Divide affords breathtaking views of several 14,000-foot peaks in western Colorado. 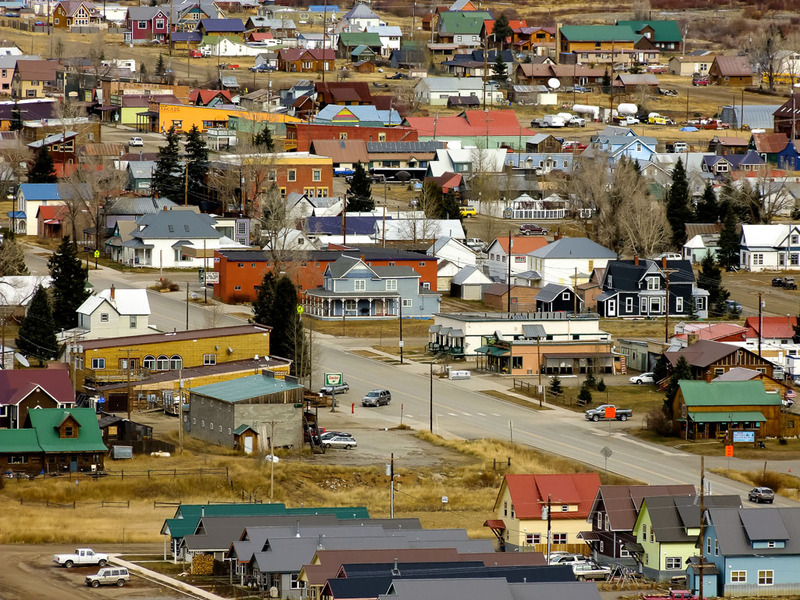 At the south end of the “Million Dollar Highway” is Silverton, Colorado. 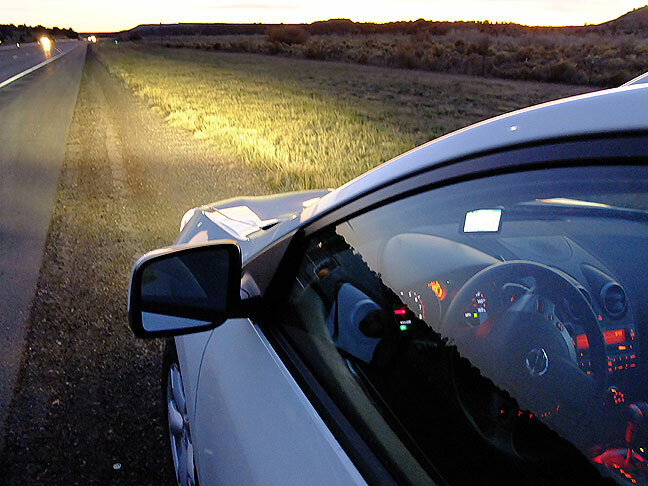 The lights from out Nissan Rogue shine on the roadside as I stop to photography a sunset in northern New Mexico. The wild road in our rear view mirror.